The growing cinephile cult for the four films directed by Elaine May is a fascinating phenomenon. The films are quite entertaining, with this 1976 low-key character study standing as the best of the quartet, but it’s hard to justify the critical movement that is intent on enshrining May as a seminal figure in the American cinema of the Seventies. 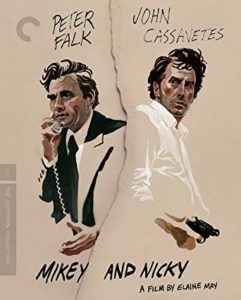 What is most striking about Mikey and Nicky is that it is a sublime crime drama/character study (what is commonly thought of as “a guy’s picture”) written and directed by a woman. Like Ida Lupino’s The Hitch-hiker (1953), it is of a piece with its hard-boiled predecessors and proves truly that the gender of the artist doesn’t matter when it comes to making a great film. Thus, the argument made in the supplements included here that May constructed a feminist dissection of crime pictures seems a reductive, tunnel-visioned view of what she really accomplished and comments on a film that is not really the one she made. The plot is simple: fugitive gangster Nicky (John Cassavetes, The Killers) is fleeing a hit man (Ned Beatty, Deliverance). Nicky asks his best friend Mikey (Peter Falk, The In-Laws), whom he has known since childhood, for help, not knowing that Mikey is telling the hitman’s boss about Nicky’s whereabouts. In casting Cassavetes and Falk in the leads, May draws on their real-life friendship and their previous work on Cassavetes films, Husbands (1970) and A Woman Under the Influence (1974). One thus gets a palpable sense of the friendship and Falk’s betrayal seems even harsher – although at one point Mikey hints that he’d like to run away with Nicky, giving the viewer the sense that he’s reconsidering his decision. The beauty of the pairing is that they function perfectly as both antagonists and a comedy team. 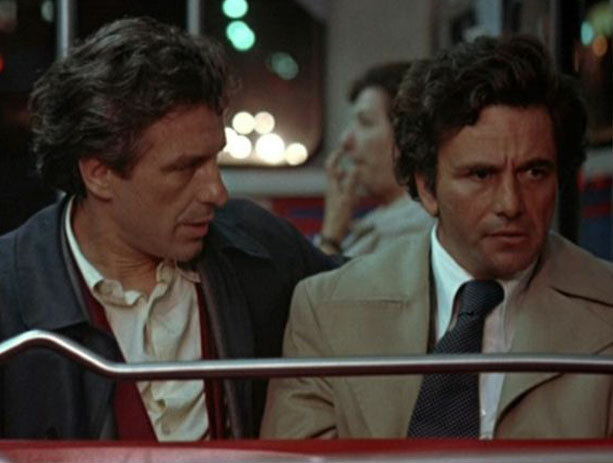 For a film with such an unforgettable downbeat ending, Mikey and Nicky has some delightfully delivered comic cross-talk sequences. Both the tense and comic sequences benefit from May’s impressive background as an improvisational performer. Her method of obtaining useful improvisations from her actors ran counter, though, to those used by Cassavetes in his filmmaking – May notoriously had the actors ad-lib for hours with the cameras rolling, whereas Cassavetes encouraged improvisation in lengthy rehearsals and then locked down the dialogue before shooting began. Given this fact, it’s asserted in both a print essay included here by critic Nathan Rabin and verbal comments in a featurette interview that there was no improvisation at all included in the film (featurette) or that “virtually none of it was” (essay). The statistic that followed May around after the film was finished was that she shot 1.4 million feet of film for this modest drama (according to New York magazine, the ratio was “140 to 1 of film shot to film shown”) because she was looking for spontaneous invention from her stars. She then took two years to edit a small-in-scope character study. The result of this indulgence shows clearly in some of the film’s best moments between Cassavetes and Falk (Cassavetes was always genuine in his acting but had some “tells” he exhibited when improvising). It also led to the film’s uniquely weird pacing, which turns from tense to funny and then angst-ridden when the two men take time out of their taut interactions to meet the women in their lives (whom they treat brutally, in a definite approximation of the tough-guy gangsters of Golden Age Hollywood). The stories about May’s onset indulgences (a tendency repeated when she directed Ishtar in 1988, and the clearest reason for the end of her filmmaking career) are only present in this package in the Rabin essay. Here the word “genius” is used and May is depicted as the victim of a major studio mogul’s villainy – the fact that her unusual “film it all” approach ranks with some of Orson Welles’ exploits in the realm of cinematic self-destruction is, of course, omitted from the laudatory remarks in this package. In an onscreen extra, costar Joyce Van Patten (TV’s The Martian Chronicles) talks about her fond memories of playing Nicky’s wife. Distributor Julian Schlossberg discusses the eye-opening fact that May’s family was mob-connected (thus her interest in the storyline) and recounts his own role in distributing the film after Paramount buried it in 1976. In another featurette, critics Carrie Rickey and Richard Brody heap high praise on May, with Rickey discussing the theme of betrayal in her films and praising her analysis of “endemic male violence” and the institutions violent men hide behind. Brody furthers this discussion by declaring Mikey and Nicky a revision of Cassavetes’ films – the fact that Cassavetes explored relationships in sometimes painful but always profound detail, and that May made three light comedies and Mikey and Nicky, marks these pronouncements as clear instances of critics describing the film they’re looking for, rather than the very fine one that actually exists. The most salient piece of info imparted in this featurette is that May based her script on a story she was told by her brother, about a hitman who had to kill his best friend.